Most likely if you purchase a Vanilla bean plant, you will be buying a rooted cutting. The temptation is to plant into a pot with normal potting mix. However this will lead to failure. If you follow good basic instructions, you can grow them in the garden as far south as Coffs Harbour. Vanilla Orchids are the source of vanilla beans, these are a tropical to sub tropical growing orchid. Vanilla is nearly as expensive as Saffron. Most of the worlds beans are grown in Madagascar, Indonesia and Malaysia. As mentioned these plants are actually a tropical Orchid, ‘V. planifolia’ is the most commonly grown variety and it is a plant that requires appropriate conditions to grow successfully. To grow these plants you will need a tropical climate, bright filtered light and high humidity. 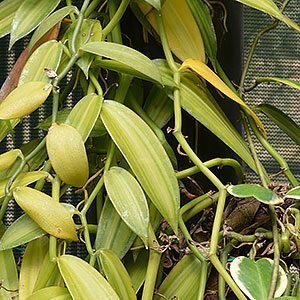 Where can you grow Vanilla Plants ? You need a climate where it remains warm year round. So in Australia areas such as far north Queensland along the coast from Cairns to the Cape York Peninsula are ideal. Some areas along the coast of the Northern Territory are also suitable. In the USA, Zones 10 – 11. However…. if you are keen, give it a go, just remember warmth, humidity, strong filtered light. A short dry period before flowering, usually during spring. A humus rich free draining soil. Lots of humus in the soil. You will also need to hand pollinate the flowers. When do you harvest Vanilla Pods. Usually in winter as the tips of the pods begin to yellow a little. It is possible to grow Vanilla Plants as far south as Coff’s harbour, however success is problematical, you will need a microclimate that provides similar conditions to above. In cooler climates you will need a greenhouse. These plants can be grown from stem cuttings that are a good size, 40cm as a minimum, you first need to ensure that the cutting will have at least two growing nodes that will be above the soil level when you plant the cutting. As these are a climbing plant they will need some support, so if you are growing in a container install a tall trellis to act as a climbing frame. If we look at the natural growing conditions we gat a good idea of care requirements. The grow is low lying forested areas from Mexico to Brazil, so warmth and moisture are essential. In the natural environment they use trees as support. Cuttings are usually stored in a plastic bag for a few weeks in a cool position, however some home gardeners plant immediately and some dip the lower section in a honey solution to improve strike rates. You will notice that some flowers just fall off after a few days, this is usually because they have not been pollinated. Hand pollination is an option, use a small paintbrush. Use a cymbidium orchid pine bark with 40 % good quality potting mix. Dot not over-pot, keep the plants almost root bound. Choose a position in dappled shade, however not deep shade. Give the plants something to climb on. Keep the root system in the shade, let the plant climb into the light. Use a weak solution of foliar spray of seaweed and or fish fertiliser until the plant is established. From planting a rooted cutting, to producing pods will take around 2 – 3 years. You will need to hand pollinate the flowers. Vanilla beans come from either V. planifolia which is the Bourbon vanilla or V. tahitensis commonly known as the Tahitian vanilla. Plants can be grown in the home garden in warmer climates or in Hothouses in cooler areas.